Photo 32. Further east, and perhaps 30km inland from the North Wales coast, that we saw at Llandudno’s Great Orme and Gloddaeth Syncline, we also see that this input of coarse clastic sediments commences, over-riding the massive platform limestones of the Loggerheads escarpment. Here, at Nercwys Mountain, just southwest of the town of Mold, we see a transition to calcareous siltstones at the base, then up into locally very coarse grained, but still calcareous cemented sandstones, which prograde northwards into the shallow marine shelf carbonate environment of the North Wales coast, and the deeper Craven/Irish Sea basin further north. These clastic sediments are the Lower Cefn y fedw Sandstone. 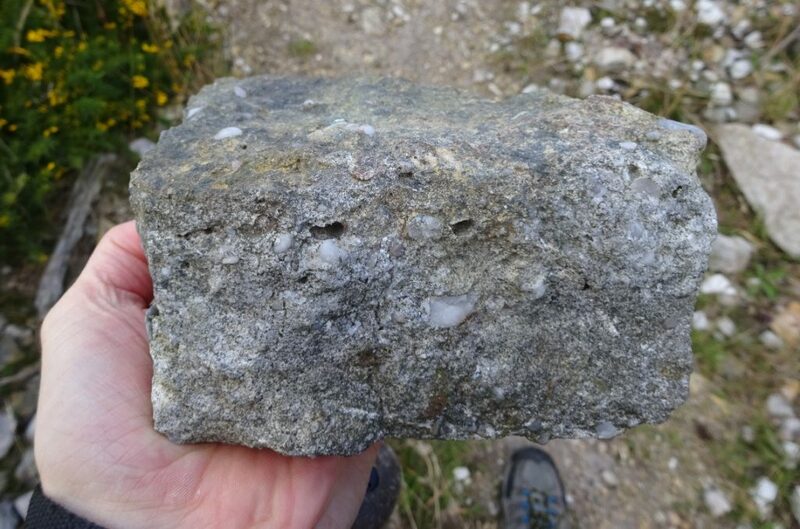 They are clearly quartzitic, with many large quartz pebbles, but also much quartz sand. Sedimentary structures found in these rocks indicate they entered the basin from the south, possibly reflecting early tectonic uplift in the Wales-Brabant land-mass, due to the impact of the early stages of the Hercynian Orogeny further south. Photo 33. Very coarse grained, poorly sorted, pebbly sandstones of the Lower Cefn y fedw Sandstone at Nercwys Mountain. 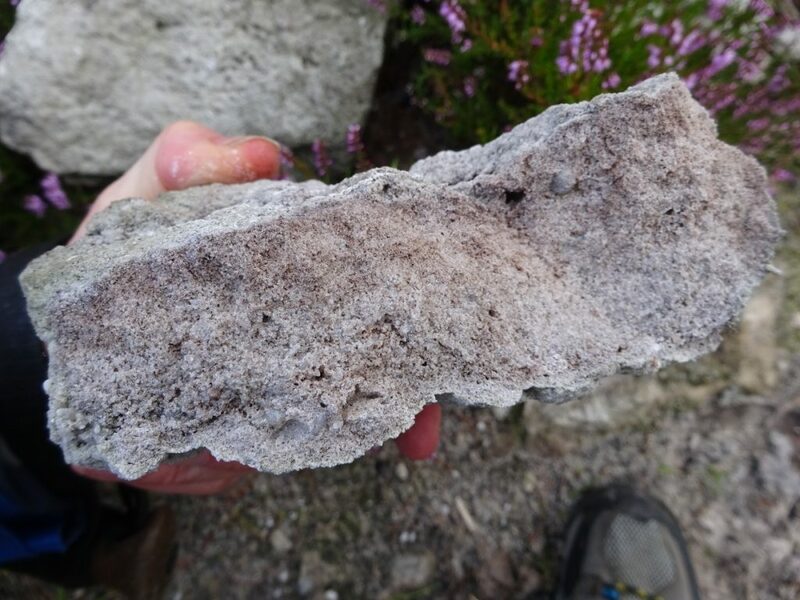 This poor sorting, and large, quartz pebbles strongly suggest these sediments were quite close to their source, believed to be the then active Bala Fault zone. Photo 34. Other parts of the Lower Cefn y fedw Sandstone are finer grained, better sorted, and calcareous cemented, so the sediment clearly varied quite rapidly, laterally and vertically, probably indicating they were proximal fluvial sediments.